Last season high water and too much debris kept us from trolling Lake Shasta for brown trout. Fortunately, a mild winter and great water conditions have paved the road to success this year. It’s been an excellent winter trolling season and all indications point to an equally impressive spring filled with catching quality browns and some chunky rainbows, too. Shasta is known around the country as a great spotted bass. Meanwhile, its incredible brown trout population is overlooked. Trophy brown season begins in October when the lake turns over and water temperature falls into the 50s. When this happens our browns migrate up tributaries to spawn. The Sacramento and McCloud River Arms see the largest migrations, but some of the smaller tributaries get browns, too. We have been catching browns all winter and are still catching them now. This bite should continue for several weeks, at least. Shasta winter/spring browns range from three-to-four pounds up to 10 pounds, or so. Our largest this year ran 10.5 pounds, which is a quality brown anywhere. We also catch some rainbows while targeting the browns, especially as spring carries on. Chasing browns isn’t for anglers looking for constantly action. We are targeting quality fish. A good day for browns is four-to-six fish, a great day is a few more than that and an outstanding day is more than 10. This is a top water fishery. Most of the fish are caught in the top 10 feet. We use side planers to catch them and constantly troll. 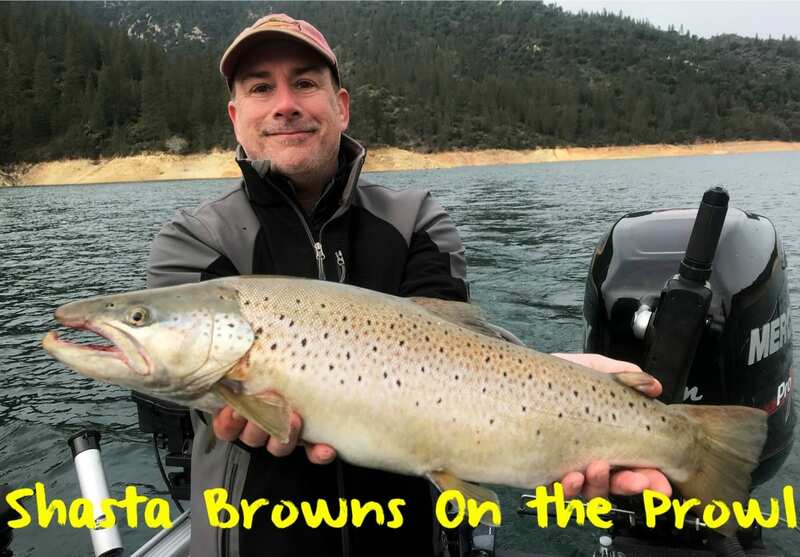 I have used several methods to get these big, weary browns to bite, but trolling two and four-inch Trinidad Tackle Optimizer spoons, Natural Fire Brine anchovies and rolling Blue Fire Brine shad are the best. We troll these with a mainline of 30-pound Power Pro and a 12-15 pound fluorocarbon as the leader. Because of the clear water Shasta browns love blue colors. If you have to choose two colors to use on Shasta I’d pick blue and silver. On the other hand, chartreuse is good when we have off color water, which isn’t the case right now. This brown trout topwater bite will last through spring. Unfortunately, when water temperatures increase the browns are more difficult to catch. When that happens they hunker down in the daytime and feed at night. Once the water warms into the high sixties the topwater bite will expire. This normally happens in late April or May. Editor’s Note: Jeff Goodwin operates Jeff Goodwin’s Guide Service. For more information on his guided Lake Shasta trips please visit https://www.facebook.com/jeffgoodwinfishing or https://www.jeffgoodwinfishing.com.